The next summer, Miss Ella Holbrook, a graduate of the San Francisco Training School, joined Miss Sudo in the work. A Sunday school, sewing school, English classes, along with home visitation kept them busy. Other denominations were in the field, but there was work for all. 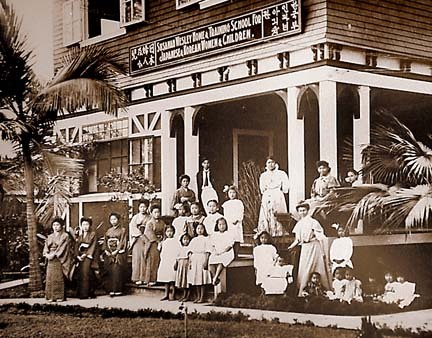 To strengthen and guide the work, a Committee for Hawaii was formed. Mrs. J.W. Hamilton, wife of Bishop Hamilton, served as chairman until 1908 when her husband was transferred to Boston. Mrs. Jennie C. Winston of Pacific Groves, California, as secretary of the committee, labored vigorously for a home. The workers needed a home [a building] and so did the neglected children whose mothers toiled in the fields of the plantations. Mrs. Winston gained supporters. Miss Libby Blois was sent out in May,1901 to replace Miss Holbrook, who had accepted an appointment as a missionary to Japan under the Women’s Foreign Missionary Society… A Bible woman trained in one of the missionary schools in Japan arrived to aid Miss Blois and shared the hardships of starting new work. In 1903, a modest home was opened. Named Susannah Wesley “in honor of one of the greatest mothers of any age,” it thrived on faith. There was no money for the support of the [residents]. Miss Blois could receive only those for whom $5.50 a month was provided. Seventeen youngsters and women began to learn the full meaning of a Christian home that first year. The objective accomplished, Miss Blois was too tired from overwork to enjoy the fruits of her labor. She returned to her California home late in 1903. About the same time the Bible woman had to return to Japan. The committee members did not despair for they knew that God was able to raise up workers. Early in 1902, Miss Dora Jayne became superintendent of Susannah Wesley Home. New quarters were secured in 1905. The stay in that location was brief. When Bishop Hamilton, accompanied by Mrs. Hamilton was in Hawaii on an episcopal visitation in 1906 he purchased what was described as a fine property. He must have considered it so for after securing all available fund from the Society, he gave his personal note for the balance. That was over $3,000. Later the Society paid the note. This new site was at 1444 King Street and had three houses and fifth rooms. It was well adapted to the proposed three phrases of work: rescue, children’s home, and a home for women. Money secured the house, but human energy made it a home. From, Ruth Esther Meeker, Six Decades of Service: The Woman’s Home Missionary Society of the Methodist Episcopal Church, 1880 to 1940, published by the Continuing Corporation of the Woman’s Home Missionary Society of the Methodist Episcopal Church, 1969.